Most people don’t have time to make breakfast on the weekdays. 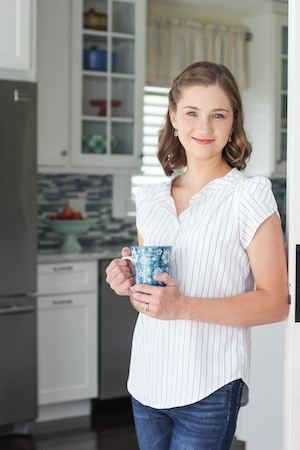 Wouldn’t it be awesome to just grab a scrumptious, homemade breakfast that takes minutes to make and you can eat it on the go? 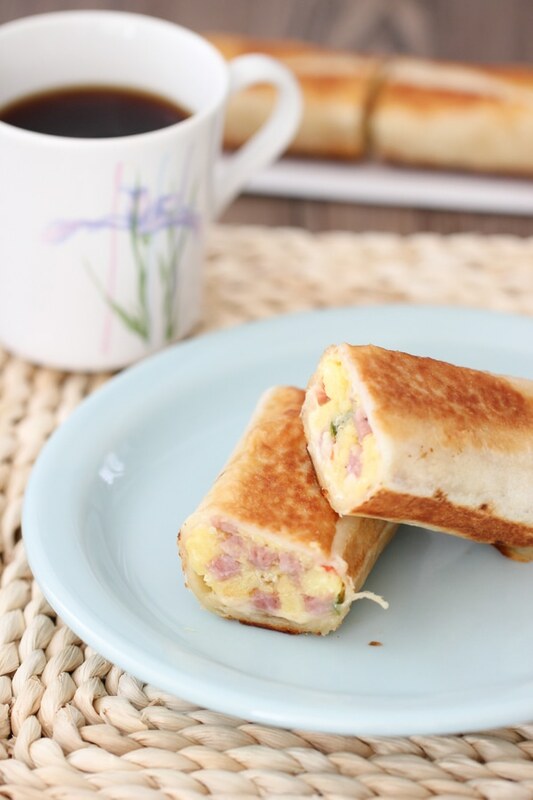 Here’s a freezer-friendly breakfast for you – Breakfast Burritos. With just a little bit of work, you can stock up your freezer with burritos that will only take 3 minutes to reheat on your busy weekday mornings. 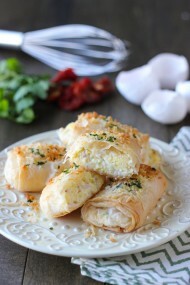 This recipe is very versatile, and you can use any ingredient combinations that you like. You can use any kind of filling ingredients that you like. Here are a few ideas: mushrooms, onions, any herbs, sausage, tomatoes, zucchini, broccoli, bacon, kielbasa, chicken, any deli meat, roasted red peppers. Place about 1/2 a cup of the egg filling into the center of each tortilla. Top with as much cheese as you like, 1/8 – 1/4 cup. 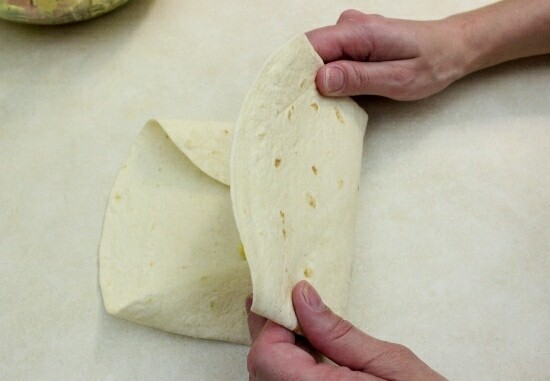 Fold the sides of the tortilla over the filling. 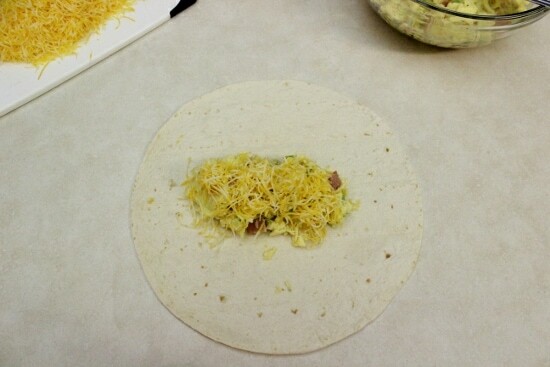 Fold the bottom of the tortilla over the filling and roll it all the way around until you have a burrito. Repeat with the rest of the ingredients. Wrap each of the burritos in parchment paper. You can wrap each burrito is several layers of parchment paper and store them in a sealed container or ziptop bag. I wrap my burritos in parchment paper and then in several layers of aluminum foil. Store in the freezer. 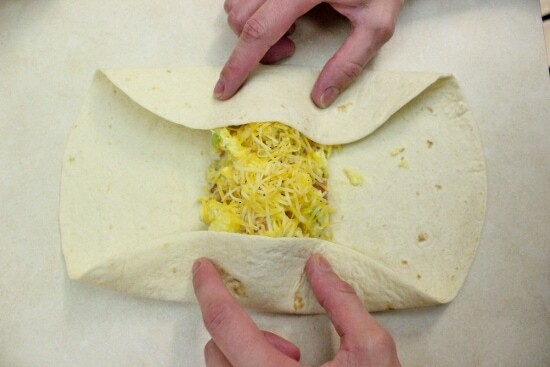 To reheat, all you have to do is unwrap the burrito leaving only one layer of parchment paper. Microwave for about 3 minutes, depending on your microwave. You can also brown them on low heat, covered, in a nonstick skillet, about 3-5 minutes per side. 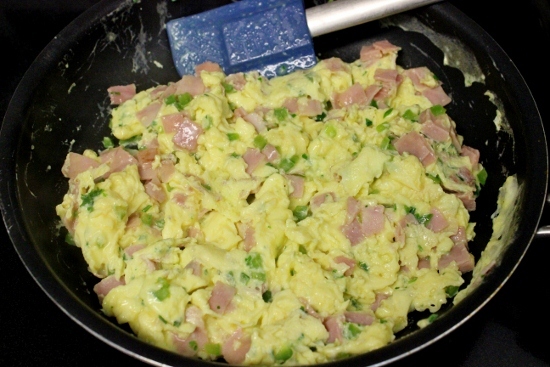 Whisk the eggs, season with 1½ teaspoon salt and pepper. Set aside. 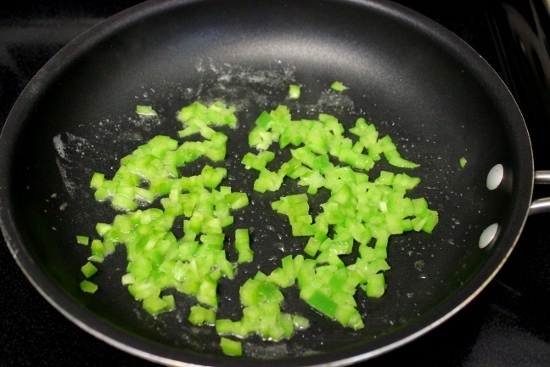 Heat ½ Tablespoon of butter in a large nonstick skillet. Add half the peppers and cook for about 3 minutes, until they are softened. 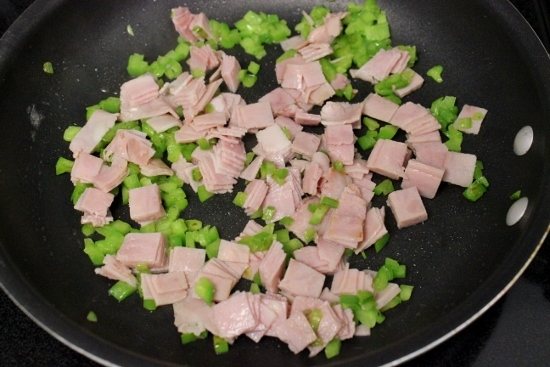 Add half the chopped ham to the peppers and cook for another 2 minutes. Add half the parsley and pour in half the egg mixture. 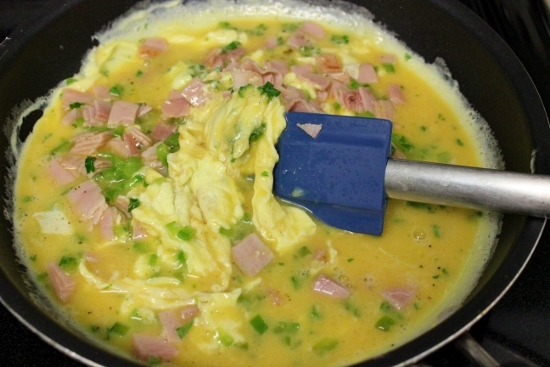 Use a rubber spatula or a wooden spoon to constantly move the egg mixture around in the skillet until the eggs are cooked but are still soft. 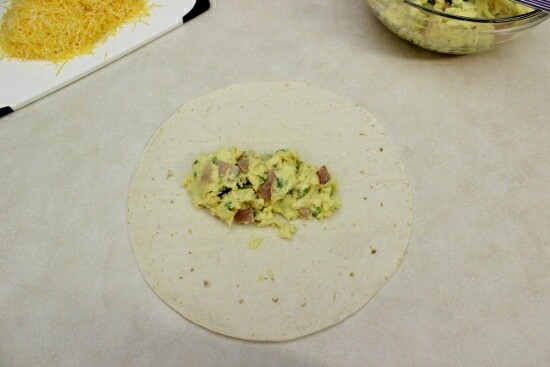 Place about ½ a cup of the egg filling into the center of each tortilla. Top with as much cheese as you like, ⅛ - ¼ cup. Fold the sides of the tortilla over the filling. 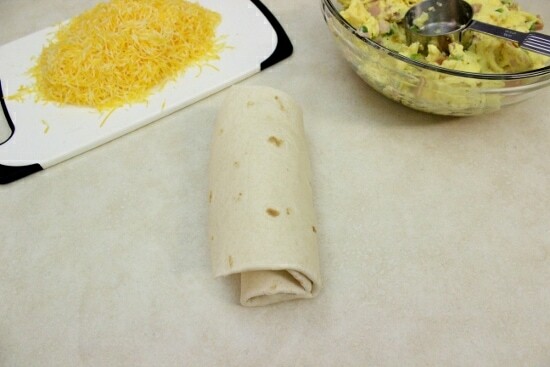 Fold the bottom of the tortilla over the filling and roll it all the way around until you have a burrito. 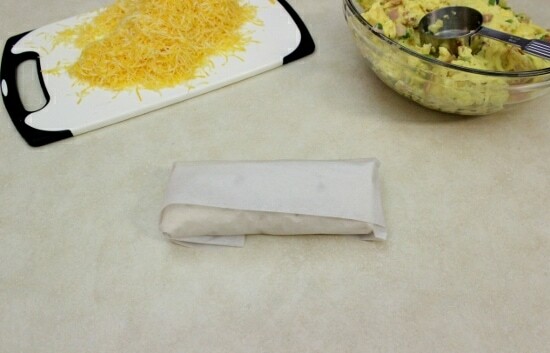 Wrap each of the burritos in parchment paper. You can wrap each burrito is several layers of parchment paper and store them in a sealed container or ziptop bag. I wrap my burritos in parchment paper and then in several layers of aluminum foil. Store in the freezer. 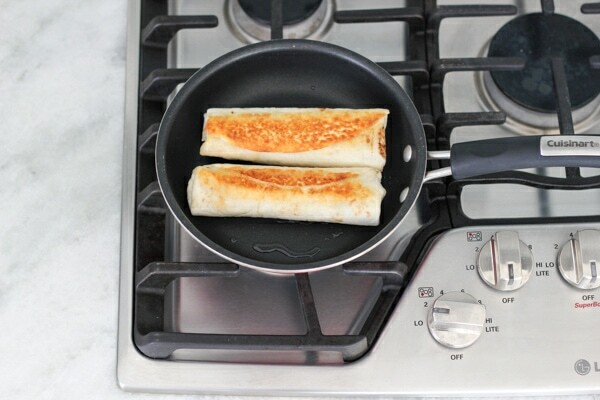 To reheat, all you have to do is unwrap the burrito leaving only one layer of parchment paper. Microwave for about 3 minutes, depending on your microwave. 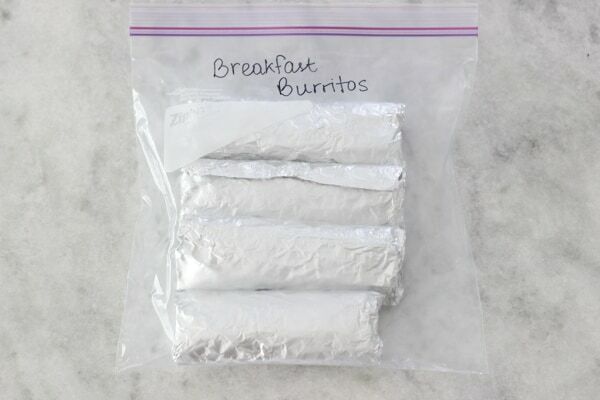 We love breakfast burritos, but I never thought of freezing them! Thanks for an awesome idea! Awesome! These could be great for school lunch too I assume? They’d thaw by lunch and then quickly reheat? I should try it… Thanks Olga! Oh, yes, Alla. It would be great to eat for lunch too. These look great. I never have time to eat breakfast. Maybe I should give these a try! I know all about working full time and running around without breakfast. With a few little tricks and preparation, you could easily feed the family from your freezer:). I usually like to do all kinds of different fillings, that way, I have a nice selection to choose from, and don’t have to eat the same thing over and over again. 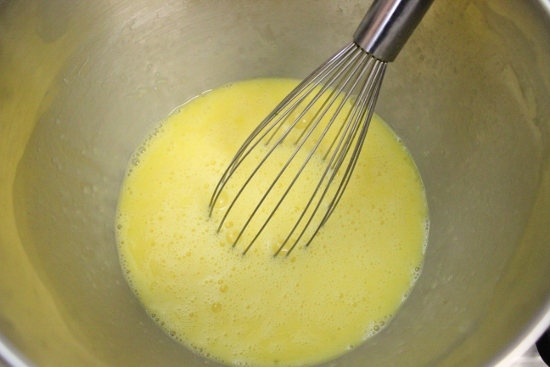 Do you let the egg mixture cool before wrapping them or do you do while it’s still hot? Just cool it until it’s room temperature, Olga. 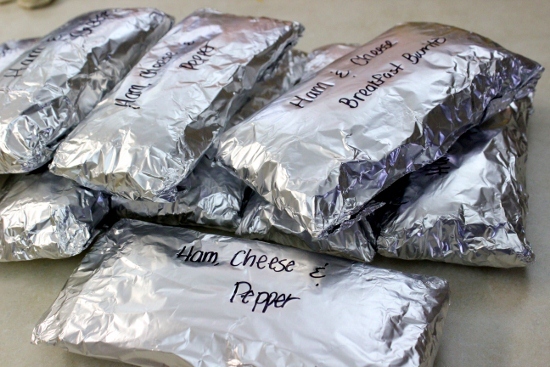 Freezing breakfast burritos…that a great idea! Why didn’t I think of that? 🙂 I will definitely have to make these…with mushrooms…yummy. Thanks! Wow! Why didn’t anyone think of this sooner!? Can’t wait to make these 🙂 Thanks Olichka. Love this idea. I make them sometimes but never frozed them so will definately need to try. We do make burritoes with left over steak and rice and add some veggies too. Maybe I should try to freeze those and see how that works. Wow! Olga you are such a genius!!! I love to cook but your idea of freezer cooking is just the best. I can’t wait to tell my mom all about it! I love this idea, but we don’t have a microwave, would a conventional oven work? An oven would work too, Alina. I’m not exactly sure how long you would need to keep it in the oven, though. It would be longer than a microwave, of course. You’ll have to experiment. I’ll try it out myself and let you know. I prefer using the oven or the stove for reheating food too. We put our microwave in a very hidden, uncomfortable spot in the laundry room, just so we learn not to use it for every little thing. Do you use flour or corn tortillas? I cant seem to find tortillas I like. Any suggestions? I like to use flour tortillas. Most of the time I use plain ones, but sometimes I like to experiment with different flavors. Tomato basil is really yummy. Great idea, Mirachka. I like browning tortillas too. The texture is so much better. I love the crunchiness. What A Great Idea! I Absoluteley Adore This! Let’s start with that I absolutely love to cook! And, always look for new ideas!! I don’t even remember how I stumbled upon your blog and let me tell you!!! Olga, I absolutely love your site!!!! Now back to this specific post. 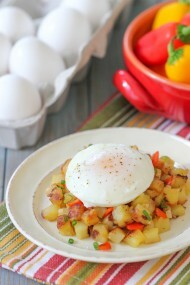 I had made breakfast burritos before but never thought of mixing veggies and eggs while cooking. On Saturady, I had made burritos your way and WOW!!! They are absolutely amazing!! The only thing that I did differently was adding mushrooms (had some in the fridge and didn’t want them to go to waste)!!! 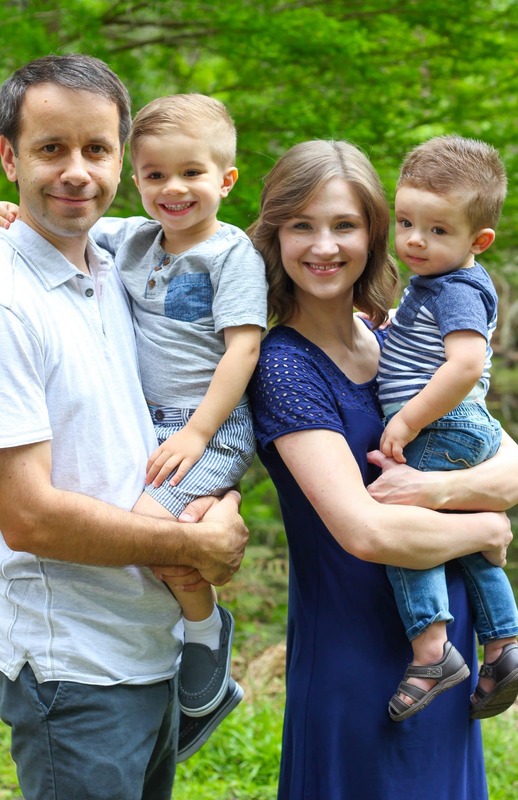 My husband loved them! Also, I shared them with my parents family and now have an outstanding order for a batch, for my brother!!! Just want to add, God bless you very much!!! And you truly have an amazing talent!!! Thank you for sharing it with us!!! I’m so happy to real of your great results. I’m glad your family enjoyed the breakfast burritos. Thanks for taking the time to write – it means a lot to me to hear your warm comments. Olga, can I reheat these in a pan after freezing? I try to avoid the micro as much as possible. Thanks for such a great recipe! Olechka, Thank you so much for such a great idea to make the extra buritoes with variety oh filling, freeze them and reheat its in microwave. It’s SOOOOO convenient especially when you don’t have time to cook breakfast or come home hungry or for any emergency. I made about 10 buritoes with variety of fillings clean so many different dishes that leftover and keep in my fridge and hate to throw away. You are such a GENIOUS!!! I’m so glad that I found your website and now I have recommended it to my friends, my coworkers and even to our patrons. Great job, Nina. Don’t you love using up ingredients and stocking up on food that can be eaten with minimum work? I’m so glad to hear that this recipe was useful to you. Thanks for sharing my website with others. I really appreciate it! Will be trying this….definitely! Do you do anything with the tortilla? Does it need to be fried? You can simply heat it up in the oven or the microwave, just until its’ warm. You can fry it up in a skillet, if you want. Oh my goodness thank you so much for this recipe. Thank you, Alla! I’m so glad you found this website helpful. I just discovered your blog the other day. I made chicken-mushroom blini today, and just whipped up a batch of breakfast burritos. Superb-I added sautéed beef, a touch of cayenne powder and chopped mixed vegtetables-excellent! thank you for having your recipes online. I use your recipes to make yummy things such as desserts and make the meal to have something to eat. I have a question for you. Do you eat your breakfast burrito plain, with sour cream, sweet sauce, or anything else? Thank you for posting your recipes online. I use them sometimes to make something delicious. I was wondering, do you eat your homemade burritos with sour cream, sweet sauce, plain or anything else? I actually eat them plain, but you can certainly eat them with salsa, Ranch dressing, sour cream, cheese sauce or anything else that you like. thank you for answering my question. I am sorry for posting the same thing twice. I thought the first message got deleted after I clicked on post, so I decided to send another message. God Bless you Olga and I hope you will be able to have a child. p.s. also on my menu for dessert are your chocolate/nutella cupcakes, they are truly amazing! Excellent recipe! I used bacon, mushrooms and red bell pepper on extra large burritos with Monterey and cheddar cheese. The recipe yielded 13 burritos. I will definitely make again! 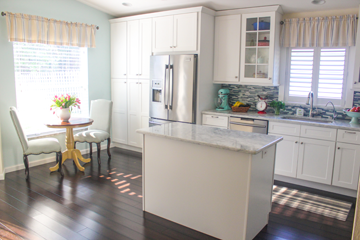 Thank you for sharing this recipe on your site! Thank you for such a helpful recipe! Do you have a brand of tortillas that you recommend? Also, how long do they last in the freezer? 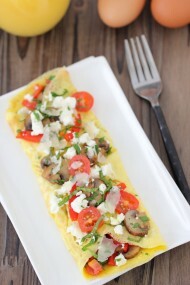 I really liked using raw tortillas from Costco; I think the brand was Tortilla Land. However, they are no longer available in our area. I don’t have another brand that I really like. The burritos will last for at least 6 months in the freezer, probably even longer, as long as you wrap them really well so they don’t get any freezer burn or absorb any smells from the freezer.